Having a quinceañera is a wonderful rite of passage in the Latino community. It goes without saying that, like every coming of age celebration, you’ll want to be sure it’s unforgettable. Maybe you think your dress, menu, imaginative activities or incredible venue will make your quinceañera stand out. We think it will be a combination of all the small details that come together to bring your quinceañera theme to life in the most beautiful and memorable way. 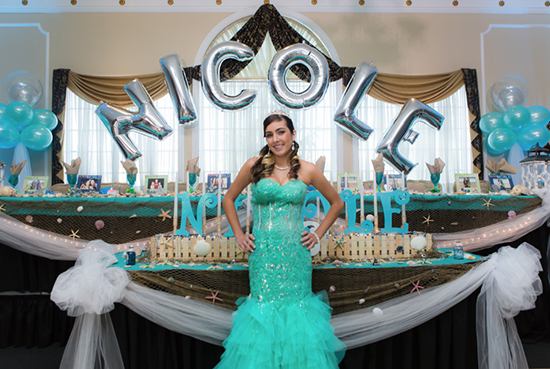 Choosing the right theme is a great start to planning a quinceañera that all your friends and family will enjoy. We want to share five of the top party themes and simple quinceañera party ideas that tri-state area quinceañeras love. White pumpkin centerpieces: A great DIY project, simply spray-paint mini pumpkins. You may even personalize them with your initials. Carriage photos: At the entry or exit, set up a life-size carriage for guests to take photos in and around. Glass slippers: Elegant decorations by themselves, and even more beautiful when filled with shiny blue candies. Tiara party favors: Another fun DIY project—add your quinceañera’s date or your favorite inspirational quote to these. These beautiful Cinderella ball ideas will be at home in a stunning and incredibly elegant venue. 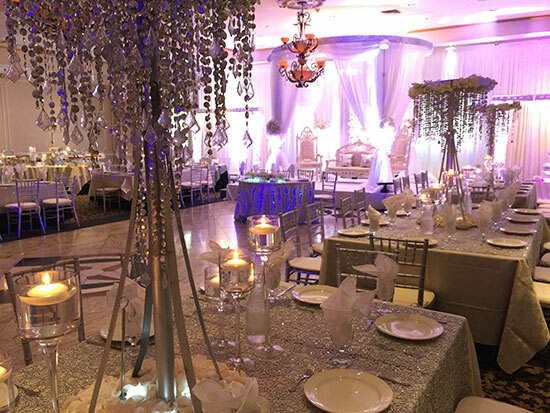 The imported Italian crystal chandeliers and granite dance floors make Jacques Reception Center an ideal location. 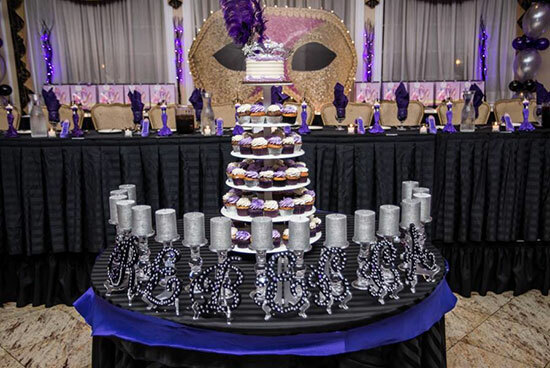 If you dream of a glamorous quinceañera, then a masquerade party might be the perfect fit. This theme calls for feathers, glitter and jewels galore! A taco station will fit right in with the red, gold and black color scheme. Or, maybe you’ll go for green, white and red colors to create a Cinco de Mayo masquerade quinceañera atmosphere. Let guests create their own tacos, masks and beaded necklaces for an exceptionally fun party. Character-inspired court: Have fun assigning each girl in your court a character to dress up as—Snow White, Belle, Pocahontas and Tinker Bell will grace your quinceañera! Disney movie posters: Custom design these with your face and party date. 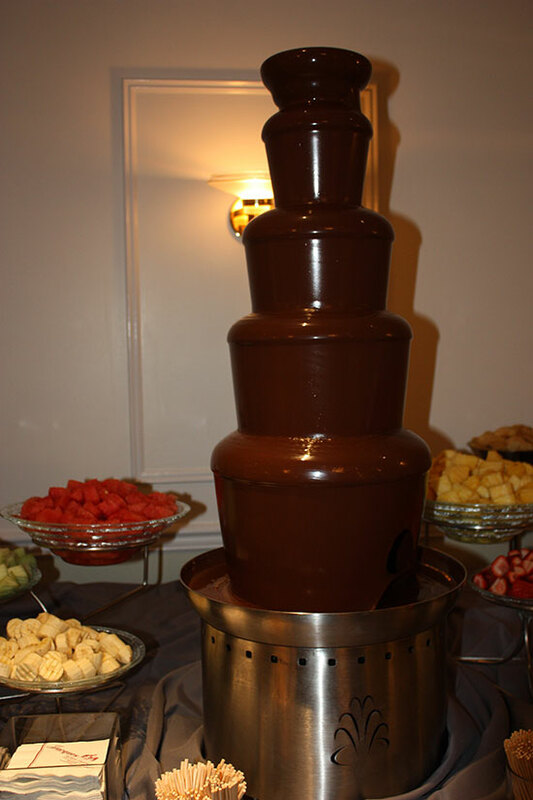 Chocolate fountain: You wont be the only one to find your favorite sweet to dip in rich chocolate. Fresh strawberries, pineapple, bananas, pretzel sticks, rice crispy treats and marshmallows complete our chocolate fountain spread. With four generations of experience by your side and our trusted partner vendors ready to attend to your wishes, there is no reason your quinceañera can’t be a true fairytale. So pick out your graceful sweet princess gown and get ready to decorate with castles, crowns, princess dolls, candles, flowers, petals, tulle and scepters. Once your fairytale vision is clear, think about what quinceañera food your guests will love. A tiara cake is a fun surprise for guests after enjoying our most popular quinceañera menu items like fajitas. Shirley temple fountain: A gorgeous way to give guests flavorful and refreshing drinks—the perfect way to get the show started. Film centerpieces: Personalize with your family photos to create a touching experience. Walk of Fame: Customize with the names of the girls in your court to let them know how much they mean to you. Photo booths: Be sure to set out plenty of Hollywood props like bow ties and Oscar awards. Flaming bananas foster: To match your color scheme, we love the idea of an artistic display of chocolate covered strawberries, but to really put on a show, let our skilled chefs light up your party with a flaming bananas foster station. There will be so much drama and excitement at your Old Hollywood-themed party, so be sure to choose a New Jersey venue with an adequate sound and audio/visual system. With a star-worthy ambiance, Jackson Crossing is a great option. Whatever theme you choose, we will present it and your quinceañera food in beautiful and creative ways that wow guests. To let us bring your quinceañera dreams to life, contact us online or give us a call at 866.522.7873. NOT SURE WHERE TO START? Give us a call at 732.671.0700 or send us a message.